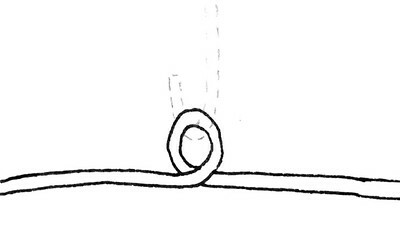 When constructing a mobile with arms that swing independently, it is common to bend the wire arm into a hanging loop at the desired balance point. But if you decide later you’d like to change the balance point – say you decide an arm would look better hanging at a steeper angle – you’d need to build a new arm with new wire or find a way to add extra weight to achieve the new look. If your hanging loops are made as “sliders” you can adjust the balance point at any time – even after the mobile is fully constructed. Sliders are made by wrapping a smaller gauge piece of wire around the arm, which forms a balance point loop that can slide left or right, and be adjusted continually until you achieve the design you want. The slider should be wrapped tightly enough to stay put on the arm yet still be able to be pushed left or right to adjust the balance point. If your slider is too loose and won’t hold its position, just pinch the slider with pliers to tighten it to the arm. Once you have finalized your design you can pinch the sliders very tightly to ensure they won’t move or use a couple drops of super glue to cement the sliders in place.